I have always felt an attraction to and a respect for the dandelion. It was the one flower which, as children, we were allowed to pick and play with, so we always considered it the children's flower. 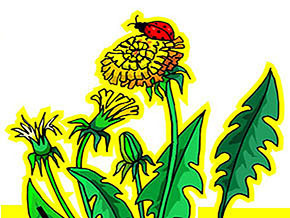 The adults, in fact, did not even call the dandelion a flower. To them, it was a "weed" and a weed to be destroyed. There were lawns around all the houses in the little mountain village where I lived in Idaho, and the dandelions which sprang up were thought to disfigure the grass. The children of each family had the task of weeding them out. We were instructed to dig the little plants up by the roots, so that they could not grow back again. This we faithfully did. Yet, no matter how many plants we dug up, new ones soon appeared. It was the determination and perse-verance which made me admire these little plants. The fancy flowers which the adults admired so much had to be protected and cared for, if they were to bloom. The dandelion, however, grew of its own accord and managed to survive, even when people were trying to wipe it out. The other day, the car I was in stopped, and I happened to look out the window. Next to the front wheel, a bunch of dandelions seemed to smile up at me. The "children's flower" had found a place to grow in a little bit of dirt, surrounded by concrete. The dandelions glistened a brilliant yellow. The dandelions remained in my mind, a reminder of childhood and an example of perseverance.